Restoration Hardware Used / Consignment Furniture Looks Like New!! Baltimore’s Favorite Consignment Furniture Store has the brand that’s very hard to find used. Not only that, but we’ve got a lot of it! If you love Restoration Hardware’s Wonderful Line of Contemporary Furniture, you need to make the trip to Cornerstone. Shown here is are some newly arrived pieces from this California Company. If you’ve ever shopped this line new, you’ll love the Huge Discount you’ll get by finding it on consignment! Remember to join our Want List for Restoration Hardware Furniture and we’ll email you a photo, price and measurement of pieces when they arrive. Summer is a Great Time to Shop for Dining Room Furniture Baltimore! We know that the surf and sun are calling. But, as you can see from the hungry-looking crowd gathered around this Beautiful Henredon Dining Room Furniture, we’ve all got to eat! And when you realize that summer time is a fabulous time to shop for Furniture Bargains, it may just be the motivation you need to start thinking about next Falls Holiday meals. So take a break from the outdoor fun to stop in and see Baltimore’s Biggest and Best Selection of Consignment Furniture! You’ll find Dining Room, Bedroom, Office Furniture and More! All prepped and polished by our workshop staff and ready to Take Home Today! Theater Seats / Recliners on Consignment at Baltimore’s Favorite Furniture Store! Even Baltimore’s Hardest Working Staff needs a break now and then! 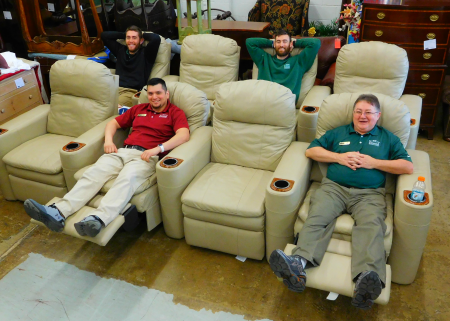 Pictured here are 4 of Cornerstone’s Best, testing out these newly arrived theater recliners. This set of 8 chairs will make any room a “Theater Room”, and they’re Ready to be Delivered Today! That means that you can watch the Stanley Cup Play Offs and the Baltimore Orioles today from the comfort of these great seats! So, let the rain fall on this wet Saturday and head on down to Cornerstone to do some furniture shopping. I think you’ll feel what so many people have since 1986- that they wish they’d found us sooner! Bedroom and Office Consignment Furniture Fill Our Dock! This photo taken yesterday afternoon shows our dock area after unpacking a wonderful Truckload of Consignment Furniture! On the left you see a nice leather top executive desk and bookcase. Throughout the picture is some very nice Solid Cherry Bedroom Furniture. All of this “used furniture” is in like new condition and will quickly move through our workshop and be brought to our preview room or onto the showroom floor. But, you don’t have to wait to see it! Stop in today and take a peek behind the curtain to check it all out. You’ll find makers like Statton, PA House, Thomasville, Knob Creek and More! 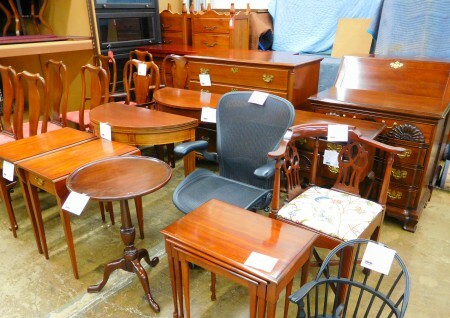 Summer Just Got Sweeter at Baltimore’s Favorite Furniture Consignment Store! 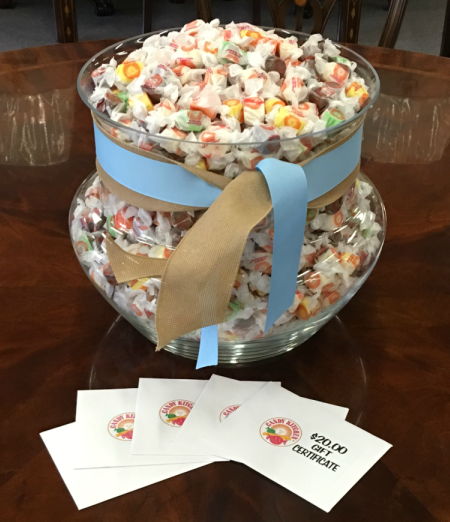 As part of Cornerstone’s Commitment to Community Outreach, we purchased this Huge Bowl of Candy Kitchen Taffy along with five $20 Gift Certificates for Ocean City’s Favorite Candy Store at a silent auction to raise money for the non-profit Believe in Tomorrow Children’s Foundation! (http://believeintomorrow.org/) For over 31 years this great organization has been helping families fighting pediatric cancer by providing Hospital and Respite Housing! During the month of April, Cornerstone is Paying It Forward by offering these gifts to our customers as a way to bring attention to this wonderful organization and to make Candy Kitchen’s Generous Gift to the silent auction go even farther! (https://candykitchen.com/) Stop in the store anytime this month and Register to Win One of the Five $20 Gift Certificates to be raffled off Tuesday, May 2nd. There is no purchase necessary and you can enter each time you visit! While you’re here, enjoy some taffy from our bowl! Save Money at Baltimore’s Favorite Furniture Consignment Store and Support a Great Non Profit! In an effort to support the arts and continue a longtime tradition of Giving Back to Our Community, Cornerstone is participating in Center Stage’s long running annual online auction. We have donated a $250 gift certificate and we encourage everyone to bid on it or any of the over 600 fabulous items donated from organizations and businesses all over our area. Center Stage is Baltimore’s Largest Regional Theater and a very big part of the area’s impressive emerging arts scene. We congratulate Center Stage on the rennovation of their Calvert St. location and are thrilled they continue to contribute their valuable efforts to the culture of our city. Here’s a link to the Auction Site- https://www.biddingforgood.com/auction/auctionhome.action?vhost=centerstage. Search “Cornerstone” to find our $250 Gift Certificate! Don’t Delay- the auction ends April 2, 2017! Herman Miller Desk Chair, Statton Drop Front Desk, Biggs Chest, Kittinger Queen Anne Dining Chairs and More! Pictured just off the dock area yesterday, these pieces are being prepped and polished for our Showroom Floor. If you like High Quality Furniture at Consignment Store Prices, you will love your visit to Cornerstone. That’s because we have Baltimore’s Biggest and Best Consignment Furniture Selection! Like / Follow us on Facebook and Twitter to Get Even More Savings! 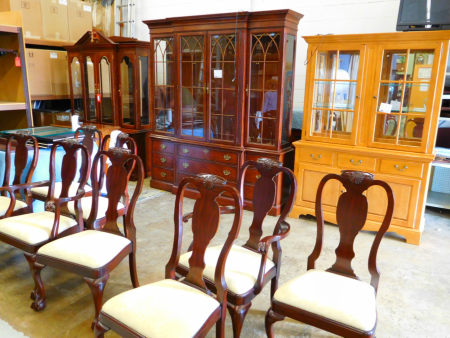 Henkel Harris Dining Chairs, Lexington Breakfront, PA House China Cabinet and Other Great Consignment Furniture Arrive at Baltimore’s Best Furniture Consignment Store! The weather in Baltimore felt like Spring yesterday, making our job of bringing in the areas Best Consignment Furniture a whole lot more fun! Pictured here just off our dock is a set of Henkel Harris Dining Chairs (part of a very nice dining room set from a local estate), a Lexington Breakfront (great height), and a Solid Maple PA House China Cabinet (perfect when you need a lighter color piece). See these and all of yesterday’s arrivals by visiting the store or watch for the pieces as we put them on our website. 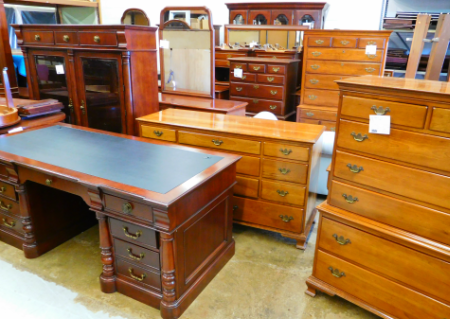 Either way you shop, you’ll find Baltimore and Washington DC’s Biggest and Best Selection of Used / Consignment Furniture! Banded Mahogany Bedroom Set for your Master Bedroom Oasis! Just arrived on our showroom floor is this Beautiful Inlaid Mahogany Bedroom Set. If you’ve been waiting to find a complete set for your Master Bedroom or Large Guest Room, wait no more! But you won’t see this set on our website inventory until later today. So, hurry in to our Timonium, Maryland Store to see it in person this morning! Other pieces arriving this week include a Leather Sofa from Flexsteel, a Sheraton Style Formal Living Room Fabric Sofa, both Formal and Casual Dining Sets and More! 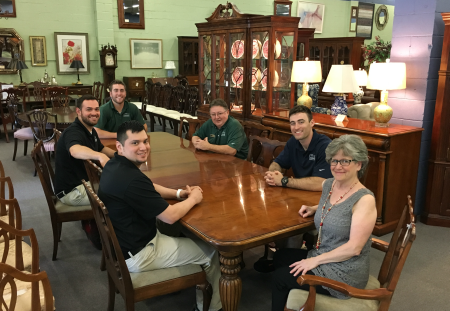 With two trucks on the road here in the Baltimore-Washington DC area, Cornerstone is always bringing in more High Quality Consignment Furniture to our 15,000 square foot store. This week’s manufacturers include Henkel Harris, Ethan Allen, Hickory Chair, Statton and More. 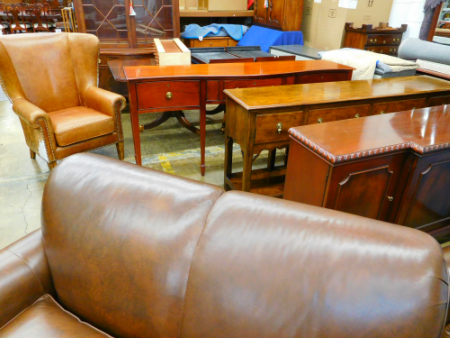 Used Maitland Smith Furniture, Used Leather Sofa, Used Wright Table Co. Sideboard and More! Yes, it’s Used Furniture! But, at Baltimore’s Favorite Furniture Consignment Store, it still looks Brand New! That’s because we’ve spent over 30 years building relationships with Baltimore and Washington DC Retirement Communities that recommend their clients turn to us when it’s time to sell their High Quality Name Brand Furniture! Pictured here in our dock area are pieces that just arrived from a Beautiful Home in Northern Virginia. While these pieces are “like new”, we’ll still check them over and polish them up before they are moved to our showroom floor. In the photo is a Used Maitland Smith Dining Room Table, a Mahogany Sideboard from Wright Table Company, a Leather Sofa and More! 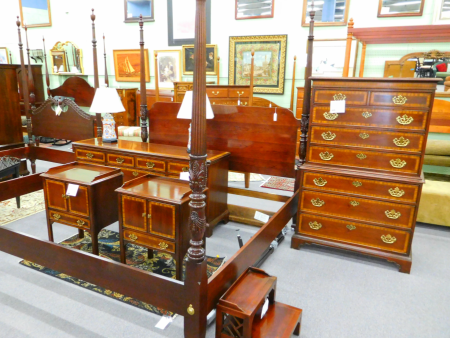 It’s hard to call them “used”, so we’ll just call them “Beautiful Consignment Furniture”.